Dr. Attaman was elected by other physicians as a Seattle Met Magazine “Top Doc” in Pain Medicine for 2015, 2016, 2017, and 2018. Dr. Attaman is qualified to perform injections in every part of the body, including the spine. He was one of the very first physicians in Washington to offer image-guided regenerative injection into the spine starting over a decade ago. 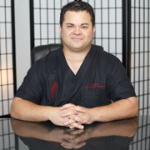 He was first treated with regenerative medicine himself as a medical student 20 years ago and has been involved with regenerative medicine procedures like prolotherapy, platelet rich plasma, and bone marrow derived stem cell procedures since that time. He offers traditional “west-coast” Milne Ongley school prolotherapy treatments and is the first physician in Washington fully trained in and offering all forms of Regenexx treatments. Dr. Attaman is board certified and Anesthesiology-fellowship trained in the medical subspecialty of Pain Medicine and Interventional Pain Management. He is also residency trained and board certified in the specialty of Physical Medicine and Rehabilitation. He is also certified at the highest level by the Interventional Orthopedic Foundation (IOF) for regenerative injection techniques in all parts of the body. He is one of only a few with such extensive qualifications in the state of Washington. Click here to learn more about Dr. Attaman’s board certifications with the American Board of Medical Specialties. He is expert at diagnosing and treating every form of pain, ranging from tennis elbow to cancer pain. He uses pain reducing injections and procedures such as Regenexx to combat difficult to treat pain conditions. He will guide his treatments to help reduce or eliminate your need for pain medications, avoid surgery, improve your function, and get you back to your life. Dr. Attaman has been training in Regenerative Injection Therapy (RIT) such as Prolotherapy since 1999 as a medical student. He has taken courses from the American Association of Orthopædic Medicine and the University of Wisconsin Medical School. He completed extensive one-on-one training wth noted Prolotherapy expert Thomas Dorman, MD. In addition, he has had extensive training in integrative and “alternative” medicine. He has trained extensively with some of the most prominent alternative medicine physicians, including Dr. Joseph Mercola (naturopathic medicine), Dr. Dietrich Klinghardt (neural therapy), and late Dr. Thomas Dorman (prolotherapy). Dr. Attaman’s goal as your physician is to offer you the best of both conventional and alternative medicine for a truly integrative approach to your pain issues.